Analog Inputs(2) balanced XLR mic-level; (2) balanced ¼" line-level (+4 dBu); (2) unbalanced ¼" switchable between line-level and high impedance (-10 dBV)Analog Outputs(2) unbalanced RCA (-10 dBV); (1) ¼" stereo headphoneDigital I/O(1) S/PDIF coaxial RCA stereo in; (1) S/PDIF coaxial RCA stereo outResolution16-bit; 24-bitSampling Rates44.1, 48 kHzFrequency Response20 Hz-20 kHz (+0.5, -0.3 dB)Total Harmonic Distortion<0.07% @ 1 kHz (mic A/B to line out)Noise LevelBetter than -88 dBu A weightedMIDI I/O(2) In; (2) OutDimensions11.5" (W) × 14" (H) × 3.25" (D)Weight4.5 lbs. A complete computer recording solution with Cubase LE 48-track recording software and GigaStudio 3 LE! TASCAM and Frontier Design Group have partnered together to create the first major innovation in USB-based audio. Start with a fully 24-bit front end, with two XLR inputs, two balanced 1/4" TRS inputs, two unbalanced 1/4" inputs (switchable to Hi-Z), and S/PDIF I/O. Four channels of audio in and two out simultaneously via USB. No opening your computer, no sound card to install - it's USB, so you can even hot-plug it. You'll spend a lot less time mousing your mix with the US-428. It's got real tactile controls for the most-used functions in your DAW applications. Transport, mute/solo and locate keys, unlimited banks of eight faders, an EQ module that supports control of up to four bands of fully parametric EQ, plus four aux sends and a panpot. It's even got 32 channels of MIDI I/O. Use one for your keys and modules, and the other for MTC, to lock your MTC-capable tape tracks to your computer. The US-428 comes bundled with a custom version of Steinberg's Cubasis VST audio recording/MIDI sequencing software. The PC version is available with US-428s shipping now, while the Mac version will be available soon and will be shipped to previous purchasers of the US-428 free of charge. Tascam and Frontier Design Group have partnered together to create the first major innovation in USB-based audio. Start with a fully 24-bit front end, with 2 XLR inputs, 2 balanced 1/4 in. TRS inputs, 2 unbalanced 1/4 in. 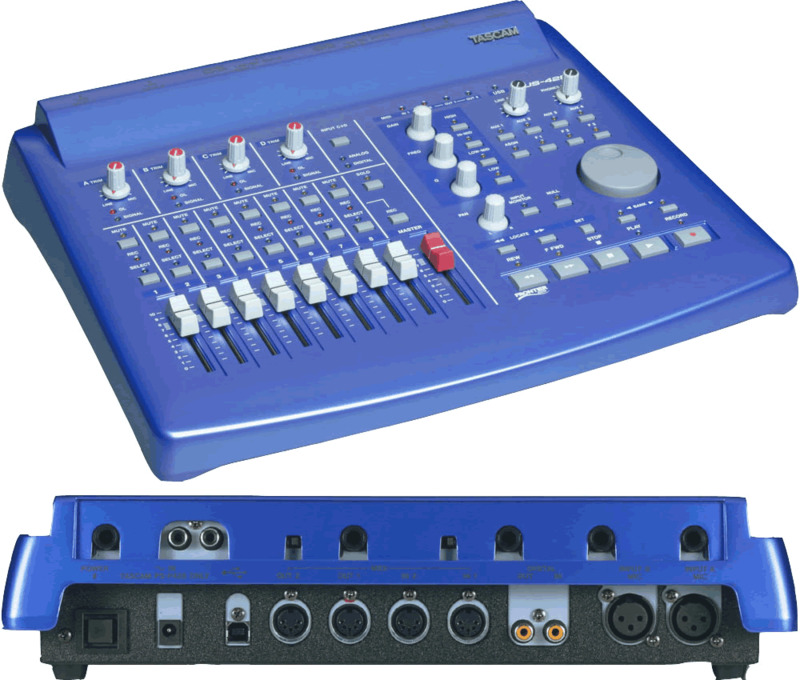 inputs (switchable to Hi-Z), and S/PDIF I/O. Four channels of audio in and 2 out simultaneously via USB. No opening your computer, no sound card to install — it's USB, so you can even hot-plug it. You'll spend a lot less time mousing your mix with the US-428. It's got real tactile controls for the most-used functions in your DAW applications. Transport, mute/solo, and locate keys, unlimited banks of 8 faders, an EQ module that supports control of up to 4 bands of fully parametric EQ, plus 4 aux sends and a panpot. It's even got 32 channels of MIDI I/O. Use one for your keys and modules and the other for MTC to lock your MTC-capable tape tracks to your computer. The US-428 comes bundled with Steinberg's Cubasis VST audio recording/MIDI sequencing software.